The Airport in Split is situated 24 km outside of the city centre in the direction of Trogir, from the Airport to Trogir city centre there is around 6 km. On the map below you can see the posible driving routes from the airport. Getting to and from Split Airport. Private or shared transfer: if you be picked up in the Airport, you can pre book a transfer, the driver would then wait for you at the airport, holding a sign with your name on it. A pre booked transfer from Split Airport to Split cost around 35 Euro, for 1-3 persons, and about 45 Euro for up to 8 persons. you can see actual prices and pre-book a transfer to Split here, if you are heading for other destinations in Croatia you can find transfer offer here Rent a Car: At the airport you have option to rent a car from local as well as international car rental companies, offers for car rental at the Split airport you can find here. Accommodation in Split and Trogir: The accommodation offer in Split range from fairly cheap hostel beds to 5 star luxury hotels, if you have not yet found your accommodation in Split yet you can find a large selection of hotels, hostel and bed and breakfast here, or here. If you are looking for reasonable priced accommodation in Trogir you can find it here. 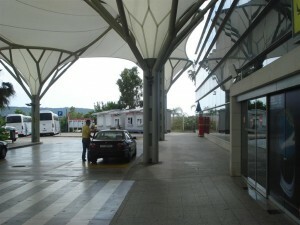 Airport bus: If you are travelling from Split Airport to Split, the airport bus can be found just outside the terminal. Departure times from Airport to Split you can find here. From the bus station in Split, there is an Airport bus driving to the Airport with out stopping on the way. Departure times from city centre to the Split Airport you can see here. NOTE: several of the departures are seasonal, other only drive on specific week days so remember to add you exact travelling date when you search the schedule. Price for a one way ticket to or from the airport is 30 kuna, tickets can be bought at the bus.